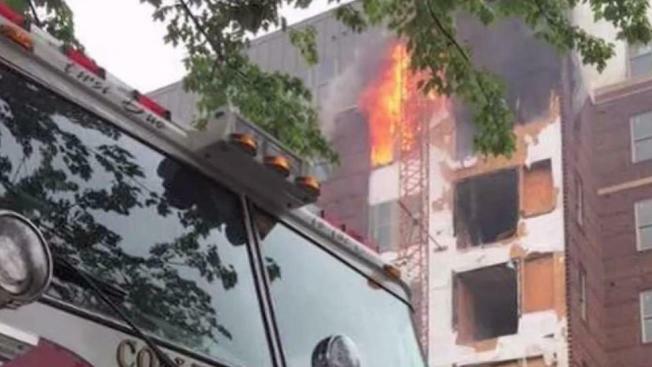 A five-alarm fire at a College Park, Maryland, apartment building burned much longer than it should have, putting firefighters and the public at unnecessary risk, according to College Park Fire Chief Bill Corrigan. The Fuse 47 building on Berwyn House Road was still under construction at the time of the fire. Corrigan told the News4 I-Team the standpipe valves firefighters typically use to pump water up through a building in an emergency were left in the "closed" position. Standpipe valve in the closed position. The design of the building limited firefighter access to the structure, Corrigan said, and the sheer size also hampered firefighter efforts. "This building was 100 percent within the allowable parameters, but it was built to the absolute max," Corrigan said. "Probably to within fractions of an inch and fractions of a square foot in every dimension that they're allowed." The five-alarm fire drew hundreds of firefighters from across the region. Thick smoke evacuated neighbors and even caused classes at nearby University of Maryland to be suspended for the day. "I came out of my office and could see that the building was on fire from two blocks away," Corrigan said. "I was kind of like, 'Man, this isn't gonna be good.'" That's because Corrigan has seen this kind of fire before, over and over again. In Montgomery County in 2014 and in Raleigh and Kansas City this past March. "Since we've had ours, there's been one in Boston, there's been one in Oakland, so it's getting to be a once every couple of weeks occurrence somewhere," said Corrigan. Buildings taller than five stories used to be considered high-rises, with strict requirements for steel and concrete construction and a more robust sprinkler system. The Fuse 47 building several months before the fire. But trade-offs in the code have allowed residential wooden buildings to climb taller and taller. In most places they can be five stories of wood built on top of a cement and steel base. "It's the least expensive way to get the most number of people living in the smallest amount of acreage," said Corrigan, who added that fires like the one at Fuse 47 can actually be six or seven stories off the ground. He said lightweight, wooden construction is more flammable than the traditional masonry style and can burn to collapse faster. Plus, the rear of the College Park building was built into a hill, with no access for firefighters. The front was largely blocked by construction equipment and power lines. Firefighters had no access to the rear of the building. Photo credit: Provided by College Park Fire Dept. Firefighters actually ran hose up the side of the building to provide water for the fire, a long and painstaking process, after realizing the standpipes, the internal water supply designed for firefighting, were not delivering water, the chief said. "So when we pumped in through the fire department connection in the front of the building, the water wasn't going anywhere," Corrigan said. "We were pumping up against a closed valve." The News4 I-Team reached out to the builder to ask about the chief's findings, but repeated calls were not returned. The building's fire sprinkler system had already been installed, but the current code did not require it to be turned on yet, since the building was still under construction. "This would have been a one sprinkler head fire, and the next day nobody would even have been talking about this incident," Corrigan said. Instead, it was still smoldering -- just like the battle sparked by all of these fires to get the codes changed. "That's a Very Dangerous Time"
Fire chiefs around the country say apartment buildings are getting bigger and bigger, but the protections that are supposed to be in place to allow that really aren't operational until renters are ready to move in. "When they're under construction they're particularly vulnerable, so for firefighters that's a very dangerous time," said Hagerstown Fire Chief Steve Lohr. Lohr was chief of the Montgomery County Fire Department in April 2014 when a blaze tore through the Gables Upper Rock apartments under construction in Rockville. "When the first arriving unit pulled up, we had sections of the roof falling off of that building," said Lohr, adding that his firefighters also had issues accessing the rear of the building, just like in the College Park fire. At the time, the Gables Upper Rock fire was the largest fire in Montgomery County history. The fire sprinklers were already installed but were not activated, Lohr said. They were slated to be turned on the next day. "Every second that passes, the fire is growing," said current Montgomery County Fire Chief Scott Goldstein, who was chief of operations at the time of the fire. The department immediately began fighting to get Montgomery County codes changed. Now, new wooden buildings can be five stories total, and firefighters have to have a path around the structure. "We did make those adjustments," Goldstein said. "And I would not be surprised if Prince George's County works on some refinements similar to what happened after Upper Rock." A group of fire officials from various Maryland departments tried to address the code issues statewide but failed in the legislature the past two years. "I think there was great opposition," State Fire Marshal Brian Geraci told News4. "I think that the bill asked for too much and I think that's what hurt us." Geraci said the American Wood Council vigorously defended the more affordable style of construction, saying when existing codes are followed and completed, the buildings are safe. In a statement to the News4 I-Team, the American Wood Council said, in part, "The intent of the recent Maryland legislation was not clear and, as a result, imposed unrealistic requirements on both existing and new construction. The requirements were expensive and of uncertain benefit." Lohr said local officials need to understand the risks. "We have buildings that are just simply too big to deploy in with the limitations that have been granted," he said. He predicts as lightweight wooden structures become popular in more rural areas, smaller fire departments and water supplies will make fires at those construction sites even harder to battle. "Let's get people with a vested interest in this, on all sides of the issue, into the same place and treat it as an engineering problem that we can sit down and propose reasonable solutions to," said Lohr, adding that Montgomery County should be an example statewide. The state fire marshal agrees and says counties shouldn't wait for the state to act. "The larger jurisdictions that could do something on the local level ought to be sternly looking at that and making those changes," Geraci said. They would also like to see fire sprinklers turned on as soon as the systems are installed and approved and maybe even switch to the more robust systems high-rises require. College Park Chief Corrigan said he plans to approach Prince George's County leaders once his investigation is complete. "It's not just a local problem to us," Corrigan said. "We have the ability maybe to be trendsetters and kind of be the ones that make the push."